MoviePass told Business Insider that Marvel’s “Black Panther” has been its best-selling movie since it dropped its price in August. The service has sold over 1 million tickets for the movie. It’s yet another honour for “Black Panther,” which has already broken several box-office records and reached $US1 billion globally since coming to theatres last month. 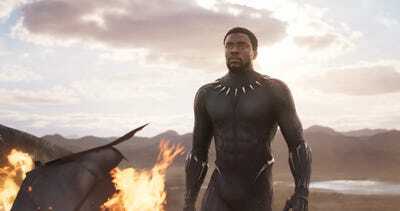 Marvel’s “Black Panther” is a box-office phenomenon and has already reached $US1 billion worldwide after just a month in theatres. But on top of all of its records, the movie is also the top-selling movie with MoviePass subscribers. In data provided to Business Insider by MoviePass (and its majority owner Helios and Matheson Analytics), “Black Panther” was listed as the service’s highest-selling movie with over 1 million tickets sold (in the period since August, when MoviePass drastically lowered its price). Subscribers to MoviePass – which allows users to see one movie a day for $US9.95 a month – took full advantage of the service in seeing the superhero film about T’Challa (played by Chadwick Boseman), the king of a secret, scientifically advanced African nation called Wakanda, who is also its super-powered protector (the Black Panther). The film broke box-office records when it first opened as the biggest February opening of all time, and the best opening yet for a movie in the Marvel Cinematic Universe with a four-day weekend of $US242 million. Audiences obviously love this movie, and perhaps MoviePass even pushed moviegoers to see it multiples times.